Digital Marketing Specialist in Delhi especially is a tough job because it is one of the top grown fields to nurture effective leads and thus sales from the generated traffic and that’s why you will have immense pressure to perform with killing deadlines with the biggest eco-centre for entrepreneurship in country. If you searched for a Digital Marketing Specialist, India or nearly locations like Gurugram (formely know as Gurgaon), Noida, Faridabad etc. then bear with me your search really ends here and read why i could be your first choice. 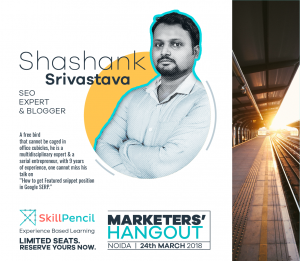 My name is Shashank Srivastava and i started my journey with a very small experiment of running a Web Design Agency back in 2008 that usually everyone does when they start with business in my age as a technical interest. After 2013 i decided to go full time for my business as a freelancer, i worked on many projects including Bitcoin and some great foreign projects i can’t name due to NDA (Non disclosure Aggrement) signed by me. I also generated good amount of money with Adsense by creating informational blogs and running Facebook, Google Ads for Clients to sell their products and services. Most active period of my life is 2016 till now as i started to help people and when you share your knowledge, it multiplies. Now i can see myself growing every single day and people/ companies who are associated with me also generating cash with less efforts being in my clientele. 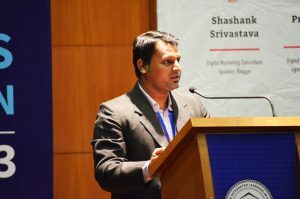 I’ve been speaking in Prestigious events Internationally and sharing my knowledge as a speaker being an SEO Expert in Delhi (according to people) and people know me by heart being the most helpful guy with deep knowledge as a Digital Marketing Consultant. I recently spoke at Roundtable, Nepal as a speaker for Search Engine Optimization secrets and was much appreciated for the kind of knowledge i shared among peers. Not much i did in this field but i found people gets more connected with us when we meet physically. 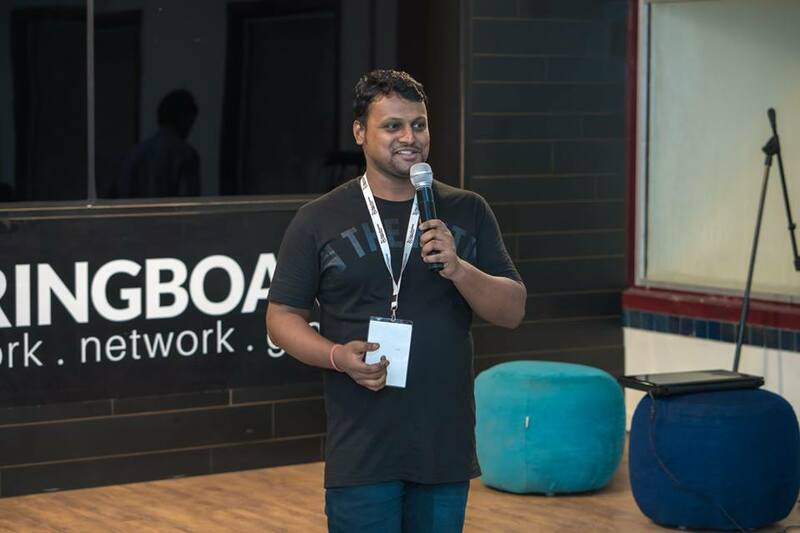 Having same thoughts in mind i and with a partner Pranav Jha, we did around 4 Offline Meetups for Digital marketing Communities to teach them what we know. We gained much exposure in this practice and we recently did an event named Digital Marketing Conference (DigiSessions) with more than 135 guest including 85+ Paid participants who literally got every penny returned in terms of practical knowledg they gained during these sessions. Back in 2016 i found that there are many online agencies don’t know the basics of Digital marketing Services in Delhi especially and as making product owners fool by their fake presence and sandbox clients which are just on papers. I decided same day to start helping people on their projects and they found values almost instantly and since then they hire me for their trickiest products and i find a killing strategy to help them form a team of Digital Ninjas who can crush the competition. Being a Digital Marketing Specialist, i invested millions to test for marketing loopholes and helped with sales for some renowned Brands in India like Kapila Pashu Aahar, JSA Auto, Blue-Quadrant Air Lines and many in the list. I tried and tested multiple channels and strategies to grow their businesses multi-fold in last 9 years of my career. My core expertise are creating Sales funnels for customer acquisition and selling products and services like a hot cake. I can also help in simplifying your product development process by finding a product market mix that can help you penetrate market in a broader way with maximum returns. I can help you setup a brand identity among your selected audience and can position you as a single brand ruling everyone. From Organic Traffic generation to running paid campaigns with media buying and PR management, i can be your best bet for Business consulting. If you are serious about the Digital marketing potential to make your business a success and you don’t have budget constraints, we can surely work together and make a denting mark in industry with your products and my efforts. Check your best Digital marketing Expert is available by writing to me at shashankessar1[at]gmail.com. or Chat with me on whatsapp.